The sport show season is upon us, and there are many vacation destinations to consider as you walk up and down the aisles. I told him he doesn’t need much time. This is something one can do in a day or two. He gave me one of those “What-you-talkin’-about?” looks, so I explained. Want to do a drift-boat trip with a fly rod? Call the Hayward Fly Fishing Company and book a trip. It’s close to home and loads of fun. I’ve been down the river with this crew and their float trips are on par with any that I have taken in the Western states. The only difference is that instead of chasing rainbow trout and steelhead, you’ll be catching smallmouth bass, pike, walleyes and muskellunge. 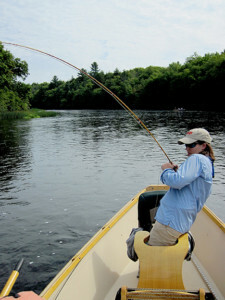 You’ll be fishing out of McKenzie-style drift boats as you wind through the scenic surroundings of the Namekagon, Flambeau and Chippewa Rivers in northwest Wisconsin. All the fly-fishing equipment, flies, lunches, beverages and snacks are provided so all you need to bring is a valid Wisconsin fishing license, hat, sunglasses, camera, appropriate clothing and a good attitude. Of course, if you have your own equipment and wish to use it, bring it along. You can count on at least an eight-hour fishing day. Check them out at www.haywardflyfishingcompany.com. Now if you want to take a week off from work and head west to the rivers for that once-in-a-lifetime float trip, do your homework. The Yellowstone and Blackfoot Rivers in Montana are, in my book, some of the best western float-fishing rivers in the country. There are loads of float-fishing options and, because of the competition, most are outstanding. Don’t take a raft trip and expect to get great fishing too, if the operation is mainly focused on rafting. I took a raft trip down the Salmon River in Idaho and was lucky to get in any decent fishing time because the focus was mainly on getting from Point A to Point B.
Alaska is another outstanding destination for drift-boat fishing, but shop your guides carefully as there are a lot of operations that don’t have very experienced guides. There are a lot of rookies and short-timers that chase around the experienced guides and your catch rate will suffer if you end up with a student instead of a master. Make sure the operation you are working with is pairing you with a guide that has at least 10 years on the resource and knows the river. You want someone who is out there every day and knows where the fish are and what they’re biting on. If you’ve never taken a float trip down a river with a fly rod, make it happen this year. No experience is necessary and it’s truly not that difficult. The guides will teach you all you need to know, and instead of it being a once-in-a-lifetime scenario, it will become a tradition.